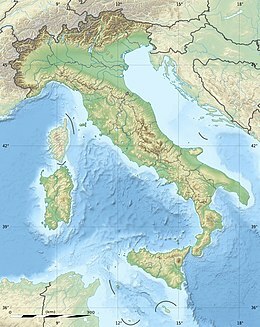 The 1997 Umbria and Marche earthquake occurred in the regions of Umbria and Marche, central Italy on the morning of September 26. It was preceded by a foreshock almost as strong as the main quake. The foreshock occurred at 02:33 CEST (00:33 UTC), rated Mw 5.7, and the second – the main shock – occurred at 11:40 CEST (09:40 UTC), rated Mw  6.0. Their epicentre was in Annifo. There were several thousands of foreshocks and aftershocks from May 1997 to April 1998, more than thirty of which had a magnitude more than 3.5. Eleven people are known to have died following the shocks. Only shocks (both foreshocks and aftershocks) with magnitude 5.0 or higher are listed. Shocks with magnitude 5.5 or higher are highlighted in light blue. The main shock with magnitude 6.0 Mw is highlighted in dark blue. ^ "NEIC: Earthquake Search Results". earthquakes.usgs.gov. 2009-10-01. Archived from the original on 2012-05-25. Retrieved 2009-10-01.